Another of the great illustrations from the 1911 encyclopedia, which shall remain nameless. What isn’t nameless is the history of this pretty vase. It is Middle Minoan and a fine example of graphic arts from the Aegean Civilization. 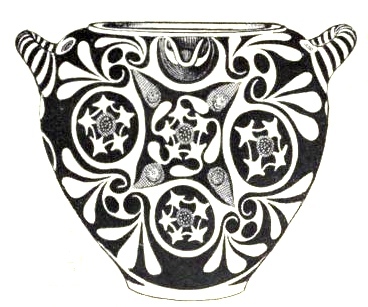 For our purposes, it is a pretty vase and household image, with a bold black and white graphical design, that to me just seems to be screaming for someone to add some flowers or a plant to.